They were killed by the Lombards in Italy about the year 579 A.D. St. Gregory the Dialogist writes about them (Dialogues, Bk. 3, Chs. 27 and 28). In one place, forty of them were beheaded. At another place, four-hundred of them were also beheaded, all because they refused to eat of the sacrifices of the idols. Additionally, these four-hundred refused to dance around the heads of the goats offered to the demons as a sacrifice by the pagans, as was the custom of the Lombards. About fifteen years ago, as they report who might very well have been present, forty husbandmen of the country were taken prisoners by the Lombards, whom they had enforced to eat of that which was sacrificed to idols, but when they utterly refused to do so, or so much as once to touch that wicked meat, then they threatened to kill them, unless they would eat it; but they, loving more eternal than transitory life, continued constant, and so they were all slain. What then were these men? What else but true martyrs, that made choice rather to die than, by eating of that which was unlawful, to offend their Creator? 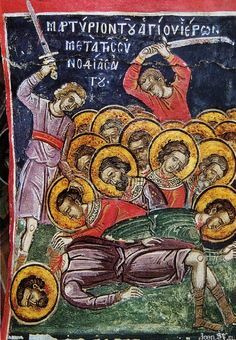 Chapter 28: Of a great number of prisoners that were slain, because they would not adore a goat's head. At the same time, the Lombards, having almost four hundred prisoners in their hands, did, after their manner, sacrifice a goat's head to the devil: running round about with it in a circle, and by singing a most blasphemous song they did dedicate it to his service. And when they had themselves with bowed heads adored it, then they also had enforced their prisoners to do likewise. But a very great number of them choosing rather by death to pass unto immortal life, than by such abominable adoration to preserve their mortal bodies, refused utterly to do what they commanded them; and so would not by any means bow down their heads to a creature, having always done that service to their Creator: whereat their enemies, in whose hands they were, fell into such an extreme rage, that they slew all them with their swords, which would not join with them in that sacrilegious act. 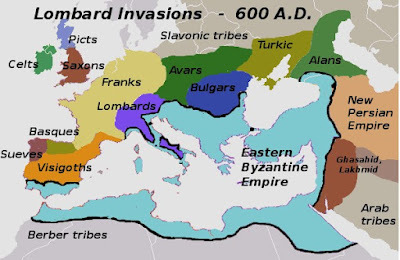 * It is thought by some that these atrocities were not committed by the Lombards properly so called, who were Arians, but by their barbarian auxiliaries, Bulgarians, Sarmatians, and Gepidae, who had come with them into Italy, and who were idolaters. Otherwise, perhaps not all the Lombards had converted to Christianity.